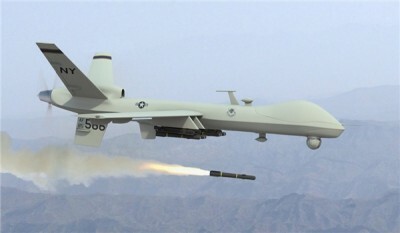 The US military drones launched airstrikes on the popular forces in an area in Tikrit that had already been purged of terrorists, leaving two dozen casualties. “In an incident against which we have had warned several times in the past, the US-led coalition attacked the Jund al-Imam Battalion popular forces’ headquarters at Speicher base in Tikrit,” Spokesman for Asaeb Ahl Al-Haq Battalion (one of the popular groups fighting alongside the Iraqi army against the ISIL) Naeim al-Aboudi said on Sunday. He confirmed that 9 people were killed and 14 others were wounded in the attack. Aboudi condemned the attack, and said no excuse could justify the air raid as the region had earlier been purged of terrorists and only the Iraqi popular and security forces were stationed there. In relevant remarks in December, a commander of volunteer forces (Hashd al-Shaabi) disclosed the US plots to evacuate ISIL leaders from the city of Ramadi as Iraqi army and popular troops are completing victory over the terrorist group. “The delay in operations to liberate Ramadi and Fallujah cities in al-Anbar province is the result of the US interference,” Commander of Imam Khamenei Battalion Haidar al-Hosseini al-Ardavi told FNA. The Iraqi forces made a considerable advance in the strategic city of Ramadi in Anbar after they reached the Tigris River.